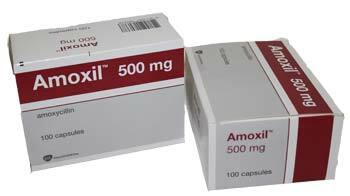 Amoxil is a penicillin-like antibiotic used to treat certain infections caused by bacteria, such as pneumonia; bronchitis; venereal disease (VD); and ear, lung, nose, urinary tract, and skin infections. It also is used before some surgery or dental work to prevent infection. Antibiotics will not work for colds, flu, or other viral infections. Amoxil is sometimes prescribed for other uses; ask your doctor or pharmacist for more information. How should Amoxil be used? Amoxil comes as a capsule, chewable tablet, liquid, and pediatric drop to take by mouth. It is usually taken every 8 hours (three times a day). Follow the directions on your prescription label carefully, and ask your doctor or pharmacist to explain any part you do not understand. Take Amoxil exactly as directed. Do not take more or less of it or take it more often than prescribed by your doctor. Shake the liquid and pediatric drops well before each use to mix Amoxil evenly. Use the bottle dropper to measure the dose of pediatric drops. The pediatric drops and liquid may be placed on a child's tongue or added to formula, milk, fruit juice, water, ginger ale, or other cold liquid and taken immediately. The tablets should be crushed or chewed thoroughly before they are swallowed. The capsules should be swallowed whole and taken with a full glass of water. Continue to take Amoxil even if you feel well. Do not stop taking Amoxil without talking to your doctor. tell your doctor and pharmacist if you are allergic to Amoxil, penicillin, or any other drugs. tell your doctor and pharmacist what prescription and nonprescription medications you are taking, especially other antibiotics, allopurinol (Lopurin), anticoagulants ('blood thinners') such as warfarin (Coumadin), oral contraceptives, probenecid (Benemid), and vitamins. tell your doctor if you are pregnant, plan to become pregnant, or are breast-feeding. If you become pregnant while taking Amoxil, call your doctor. if you are having surgery, including dental surgery, tell the doctor or dentist that you are taking Amoxil. What side effects can Amoxil cause? What storage conditions are needed for Amoxil? Keep Amoxil in the container it came in, tightly closed, and out of reach of children. Store the capsules and tablets at room temperature and away from excess heat and moisture (not in the bathroom). Throw away any medication that is outdated or no longer needed. Keep the liquid medication in the refrigerator, tightly closed, and throw away any unused medication after 14 days. Do not freeze. Talk to your pharmacist about the proper disposal of your medication. Keep all appointments with your doctor and the laboratory. Your doctor will order certain lab tests to check your response to Amoxil. If you are diabetic, use Clinistix or TesTape (not Clinitest) to test your urine for sugar while taking Amoxil. Do not let anyone else take your medication. Your prescription is probably not refillable. If you still have symptoms of infection after you finish the Amoxicil, call your doctor.